If you combined elements of cardiovascular disease, diabetes, and obesity, you’d have a condition called “metabolic syndrome.” This is a serious medical condition that doesn't get enough attention. Metabolic syndrome is a precursor to diabetes and coronary artery disease. If you have 3 or more of these criteria, then you have metabolic syndrome. Gerald Reavens, MD, recognized this constellation of symptoms as a distinct clinical condition in 1988 and named it “Syndrome X” (yes, really), though it was actually described as early as 1923 (Janiszewski PM, et al. 2008). The first "official" recognition of this health problem appeared in 2001 with the publication of guidelines by the National Cholesterol Education Program Adult Treatment Panel III (ATP-III). Over the years, this condition was given several different names. It has also been called "Reaven's syndrome", "dysmetabolic syndrome", and "insulin-resistance syndrome" (Mitka M. 2004). Eventually, it came to be known by the term we use today: metabolic syndrome. PREVALENCE OF METABOLIC SYNDROME IN THE U.S. According to statistics from the CDC’s ongoing NHANES surveys, in the early 1990’s, 23% of adults in the US qualified as having metabolic syndrome (Park Y-W, et al. 2003). That was a huge number, but it has gotten worse since then: currently, a staggering 34% of adults have it. That’s 75 million people. Even more mind-boggling are estimates that 1-3 million teenagers also have it! (Go AS, et al. 2013). In my opinion, just ONE teenager with metabolic syndrome is too many! If a person develops this condition in their teenage years, it increases their risk for serious cardiovascular disease as an adult (Morrison JA, et al. 2007). Grouping these 5 abnormal findings together and assigning the name “metabolic syndrome” gives it a certain mystique and elevates it to the level of a medical condition, which it is. Use of the word “metabolic” is logical because these people do have something wrong with their metabolism. Blood glucose and blood triglycerides are both elevated, and cholesterol levels also indicate an unhealthy state: the HDL-cholesterol (the “good” cholesterol) is too low and the LDL-cholesterol (often termed the “bad” cholesterol) is too high. In reality, these people don’t have any mysterious disease at all. Rather, their normal metabolism is malfunctioning because they simply don’t get enough exercise!!! Metabolic syndrome is a result of gaining weight and remaining sedentary for years and years. After several months of not exercising, your body’s ability to process (metabolize) substrates such as glucose, triglycerides, and cholesterol becomes less efficient. This, then, shows up as elevations in blood glucose, blood triglycerides, and an undesirable cholesterol profile. And, obviously, weight gain is just another manifestation of no exercise, too. Honestly, metabolic syndrome is no more a disease than are cavities in your teeth. These conditions are not diseases; they’re health problems caused by neglect! Is that label insensitive? Perhaps. But, it conveys the root of the problem to people much more clearly than "metabolic syndrome" does. By proposing that we should refer to metabolic syndrome as couch potato syndrome, I don’t want to minimize the seriousness of this condition. Clinical research shows that the risk of cardiovascular disease increases as the number of metabolic syndrome findings increase…ie., having 2 of the 5 criteria is worse than having just 1, having 3 is worse than 2, etc. (Malik S, et al. 2004) (Wannamethee SG, et al. 2005). And a man with metabolic syndrome has the same risk of dying from a heart attack as a man who has already had one. Clearly, metabolic syndrome is a very serious condition! Health care professionals might prefer a more scientific sounding term such as “exercise-deficiency syndrome.” This term is also an improvement because it emphasizes how this condition should be treated. Medical professionals need to start thinking of health problems like these as what they really are: a disruption of normal physiology, not a genetic/biochemical disease. Metabolic syndrome is preventable with regular exercise and smart nutrition. The increase in the number of cases of metabolic syndrome reflects lack of regular exercise and not following a smart diet. So, using drugs to manage metabolic syndrome doesn’t make much sense. Because the fundamental cause of metabolic syndrome is not enough exercise, then, the first thing to do is correct that...even before losing weight: Research shows that improving aerobic fitness reduces the risks of metabolic syndrome even in people who are obese (Katzmarzyk PT, et al. 2005). People who are anemic have low energy. Would it make any sense to try and fix this by giving them a CNS-stimulant, or, telling them to consume more caffeine? Of course not. Their energy levels will automatically improve when their iron balance is restored because fixing that will, in turn, improve oxygen delivery to every cell in the body. • Blood pressure may normalize. Aerobic exercise can be effective for lowering blood pressure. • Elevated blood glucose and blood triglycerides normalize. You don’t have to be an exercise physiologist to understand that exercise increases the body’s demand for energy substrates such as carbohydrates (glucose) and fats (triglycerides). Exercise improves the actions of insulin. This stimulates cells to absorb glucose from the bloodstream. Triglycerides are also utilized more readily. 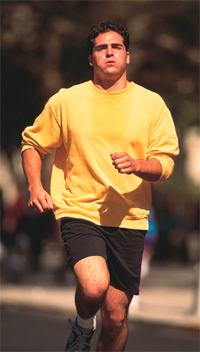 In general, exercise is very effective for lowering an elevated triglyceride level. 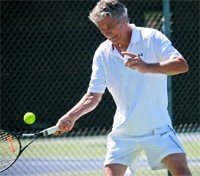 Thus, exercise addresses 2 more of the abnormal findings in metabolic syndrome. • Cholesterol metabolism improves. There is a constant dynamic process occurring between cholesterol storage and cholesterol retrieval in the body. Think of LDL and HDL as transportation vehicles for cholesterol: The LDL “particle” shuttles cholesterol from the liver to other areas of the body where it is stored for later needs. The HDL “particle” brings cholesterol back to the liver where it is used to make estrogen, testosterone, and vitamin D.
In people who don’t exercise, the retrieval side of the cholesterol cycle is not very active. So, the storage phase dominates. In this scenario, circulating levels of HDL are low because the body is not “calling out” for HDL to bring cholesterol back to the liver. However, when a person performs aerobic exercise regularly, the retrieval phase is stimulated. 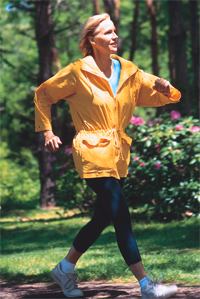 People who maintain a high degree of aerobic fitness demonstrate high circulating levels of HDL-cholesterol. HDL-cholesterol levels increase in direct proportion to how many miles people run per week. This has been demonstrated in both men and women. High circulating levels of HDL-cholesterol simply reflect that the retrieval side of the cholesterol cycle has been revved-up. This is how exercise corrects an abnormally low HDL. • Weight loss may occur. And, of course, aerobic exercise is always important in weight loss. Losing weight helps to lower blood pressure and improve fasting blood glucose. In fact, aerobic exercise addresses all 5 of the findings in metabolic syndrome. And if "increased resting heart rate" was part of the diagnostic criteria of metabolic syndrome, it would address that, too! So, aerobic exercise is the perfect prescription for people with this condition! AEROBIC EXERCISE or RESISTANCE EXERCISE? 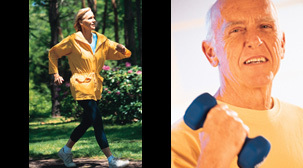 OK, exercise is beneficial for people with metabolic syndrome. But, what type of exercise? And, how much? How many drugs would be needed to match those results?!! • Cycling: The HERITAGE Family Study revealed that riding a stationary bicycle at a fairly high intensity for 50 minutes per day, 3 days per week, produced improvements in all parameters of the metabolic syndrome except for low HDL-cholesterol levels. At the end of this 20-week study, 32 of the 105 subjects were no longer classified as having metabolic syndrome (Katzmarzyk PT, et al. 2003). All of the exercise programs lasted 8 months. At the end of the study, it was apparent that the aerobic exercise program was much more effective than working out on Cybex machines. Curiously, the combination program was only slightly better. The researchers concluded that the extra time required to perform both aerobic and resistance exercise wasn’t really worth it (Bateman LA, et al. 2011). Bottom line? While exercise can improve all aspects of the metabolic syndrome, it might not reverse all of them completely. However, that doesn’t suggest that you shouldn’t try. Aerobic exercise appears to be more beneficial for metabolic syndrome than resistance exercise. A regular walking program can be helpful and, if you can do it, higher intensity exercise is even better. If you can find an exercise physiologist to develop a specific plan for you, that would be superb. But, if not, I offer some tips below. What if you don’t currently have metabolic syndrome? If you maintain your fitness, will this reduce your chances of developing it? • For walking, those who walked faster and longer had a lower incidence of these health problems compared to those who walked slower or walked shorter distances (Williams PT. 2008a). • For running, a similar trend was discovered: both longer total distance run per week and a higher degree of aerobic fitness correlated with a lower incidence of these 3 health problems (Williams PT. 2008b). • In one study, over 10,000 patients were evaluated at the Cooper Clinic in Dallas. Their fitness level was noted and they were followed for roughly 5 years. It was found that people who maintained a high degree of aerobic fitness were the least likely to develop metabolic syndrome. This trend was especially evident in men though it was apparent in women as well (LaMonte MJ, et al. 2005). • A separate report of patients studied at the Cooper Clinic showed that maintaining muscle strength also reduced the risk of developing metabolic syndrome. In this study, over 3000 men were followed for 6.7 years. Researchers found that maintaining muscular strength was effective for reducing the development of metabolic syndrome whether the man was overweight or obese, or, normal weight (Jurca R, et al. 2005). Between 1980 and 2003, 3,233 men, aged 20 to 80 years, who were initially free of metabolic syndrome had 2 or more clinical examinations, including baseline muscular strength and cardiorespiratory fitness assessment. Muscular strength was quantified by combining body weight-adjusted 1-repetition maximal measures for leg and bench presses; and cardiorespiratory fitness was evaluated by maximal treadmill test. Mean duration of follow-up was 6.7 years. Statistical analysis revealed that the risk of developing metabolic syndrome was incrementally lessened by each successive category of muscular strength...ie., as strength improved, the likelihood of developing metabolic syndrome went down. The inverse trend persisted even after adjusting for smoking, alcohol intake, number of baseline metabolic syndrome risk factors, family history of diabetes, hypertension, and premature coronary disease (P = 0.004), but it was weakened (P = 0.06) after further adjustment for cardiorespiratory fitness. "Muscular strength was inversely associated with metabolic syndrome incidence, independent of age and body size," the authors write. "Potential benefits of greater muscular strength presumably through resistance exercise training should be considered in primary prevention of metabolic syndrome." DOES REGULAR EXERCISE PREVENT DEATHS DUE TO METABOLIC SYNDROME? But, does regular exercise actually reduce the rate of death from metabolic syndrome? Yes! Another report from the Cooper Clinic in Dallas showed that fit men who have metabolic syndrome have a lower mortality rate than unfit men with metabolic syndrome (Katzmarzyk PT, et al. 2004). • First, if you currently have metabolic syndrome (or any of the 5 health problems that it represents), check with your personal physician before beginning a new exercise program. • After you receive the go-ahead from your physician, buy a good pair of running shoes. Even if all you do is walk, you’ll appreciate good running shoes. Shoes designed for walking are also available. But, while it’s acceptable to walk in running shoes, you probably don’t want to run in walking shoes. In other words, you have both options covered with running shoes! • Consider buying a heart rate monitor, a pedometer, and/or an activity tracker. The heart rate monitor will help you gauge the intensity of your exercise sessions. The pedometer or activity tracker will tell you how much activity you get each day. • Aerobic exercise is more effective for metabolic syndrome than resistance exercise so start with that. Go for a brisk walk 5 days per week. Brisk walking is described as “walking with a purpose.” Swing your arms. Get your heart rate up. Try to walk for 30 minutes. When you can, throw in a short (30-60-second) jog. • Once or twice per month, assess your resting heart rate. This is best done when you first wake up, even before you sit up in bed. As your aerobic fitness improves, your resting heart rate will decrease. If your resting heart rate is 70 beats per minute or lower, and you aren’t lightheaded when you stand up, you can feel fairly confident that your cardiovascular health is pretty good. • Eliminate soda pop. Be aware of processed foods that contain high-fructose corn syrup and try to minimize those, too. Also reduce your consumption of other refined carbohydrates. Consume healthy fats and make sure you get roughly 1 gram of protein per kilogram of body weight per day. Consider following a Mediterranean diet pattern or a plant-based diet like Dr. Joel Fuhrman's "Nutritarian" diet. Do this for the rest of your life! 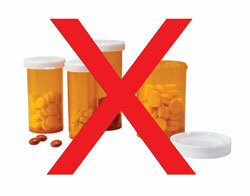 Stan Reents, PharmD, is available to speak on this and a variety of exercise-related topics. (Here is a downloadable recording of one of his Health Talks.) He also provides a one-on-one Health Coaching Service. Contact him through the Contact Us page.